LFI Medical is committed to quality and innovation. Our robust ISO 13485 certified quality system and committed team result in a consistently excellent product. Our innovative quality professionals are committed to optimizing quality, service and cost for your program. The recent addition of an OGP Quest 650 five-axis vision/laser inspection system (link to high speed inspection page below) enables our team to measure high precision components with extreme precision and efficiency. 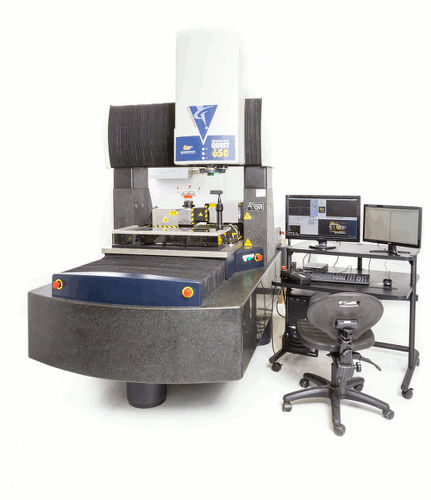 In fact, this cutting edge system is the only of it’s kind located at a contract manufacturer in the US. This commitment to innovation provides the tools needed to inspect the most intricate and groundbreaking life saving technologies. Our robust quality system, well-documented process controls, continuous improvement efforts and experienced team ensure that you can rely on LFI Medical to deliver superior quality, all the time. Risk is inherent in all manufacturing, but especially in today’s medical device industry where the difference between a good and bad part can mean someone’s life. Understanding how to mitigate that risk is key to success and key to doing business.At LFI Inc., we’re able to gain our customers’ complete confidence in our processes through a practice known as “Validation”. An effective process validation contributes significantly to assuring product quality by establishing scientific evidence that a process is capable of consistently delivering quality goods. This is done through statistical analysis of data collected as part of a pre-approved protocol. The knowledge and understanding gained is the basis for establishing an approach to control the manufacturing process; specifically controlling the variation of the process in a manner commensurate with the risk it represents to the process and product. Validations consist of three separate lots from which random samples are selected, inspected and analyzed using Minitab. The Minitab analysis below analyzes weld strength data gathered during a laser weld validation. The left side of the six-pack implies a stable process demonstrated by the randomly distributed control charts. 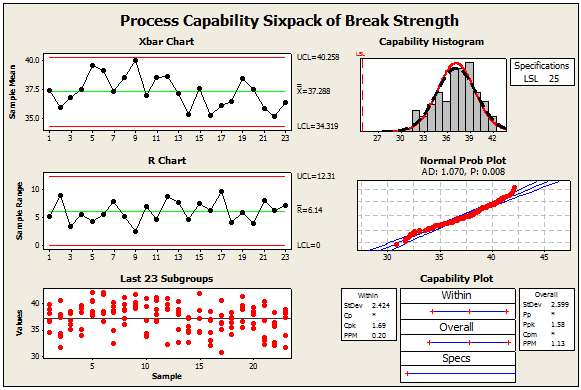 The right showcases a well centered histogram, a clean normality plot, and a very strong process capability of 1.69 which is 5(sigma) level, or 1 DPMO. Contact us (email goes to answers@lfimedical.com) to learn how your product can be manufactured to these high standards. LFI Medical recently installed a new Smartscope Quest 650 by OGP for inspection of high precision components and assemblies. It is the only machine of its kind at a contract manufacturer in the US. High-speed linear motors, multi-sensors, touch probes and 3D geometric functionality contribute to rapid inspection throughput. This technology has enabled us to access and measure components and features that were previously unable to be inspected in a non-destructive manner.